General Dynamics Ordnance and Tactical Systems–Canada offers two different types of 20mm Target Practice (TP) rounds: – The 20mm M55A2-TP – The new C144 PGU 27/B TP. 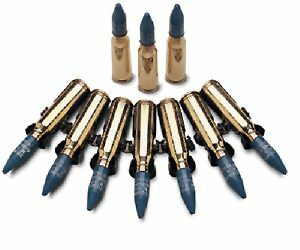 The 20mm target practice rounds are designed for use with M61 guns on F-18 aircraft and are compatible with M39 guns, automatic 20mm cannons mounted on fighter aircraft, helicopters and some ground-to-air defense systems. All meet international standards, including US and Canadian military specifications. Flight simulations conducted at extreme temperatures and pressures have proven their reliability under the most severe conditions. The 20mm ammunition family are completely sealed and 100% waterproof. The 20mm M55A2-TP cartridge was the first generation of 20mm training ammunition. Introduced into service in the mid-1960s, it is still in use in many countries. Recent optimization of the propellant design reduces barrel wear and erosion, while improving watertightness to eliminate any possibility of long action times. The profile of the projectile was also slightly modified to better match the trajectory of the operational cartridge. The 20 x 102 mm Target Practice (TP) C144/PGU 27B cartridge is designed for use with the 20 mm M61 and M39 automatic guns, but it will function in other 20 mm weapons compatible with a cartridge case length of 102 mm. The projectile configuration and the propellant are modified (compared to the M55A2 version) to better match specific operational users requirements. It is 100% waterproof at a partial pressure of 3.6 psi (25 Kpa) which is consistent with flight conditions at an altitude of 10,600 m. The primer is designed to prevent any delay ignition and critical primer characteristics are 100% controlled to prevent self-ignition from occurring under any circumstances. The 20 x 102 mm Target Practice (TP) M55A2 cartridge is designed for use with the 20 mm M61 and M39 automatic guns, but it will function in other 20 mm weapons compatible with a cartridge case length of 102 mm. It is 100% waterproof at a partial pressure of 3.6 psi (25 Kpa) which is consistent with flight conditions at an altitude of 10,600 m. The primer is designed to prevent any delay ignition and critical primer characteristics are 100% controlled to prevent self-ignition from occurring under any circumstances. M61 guns on F-18 aircraft and are compatible with M39 guns, automatic 20mm cannons mounted on fighter aircraft, helicopters and some ground-to-air defense systems.